The purpose of the fence – is it for privacy? or security? or a decorative feature? or both? or to keep wildlife out? or something else entirely? Depending on your requirements, there may be just one or perhaps several fencing types which are suitable for your needs – hopefully we will have explained the benefits and drawbacks here! 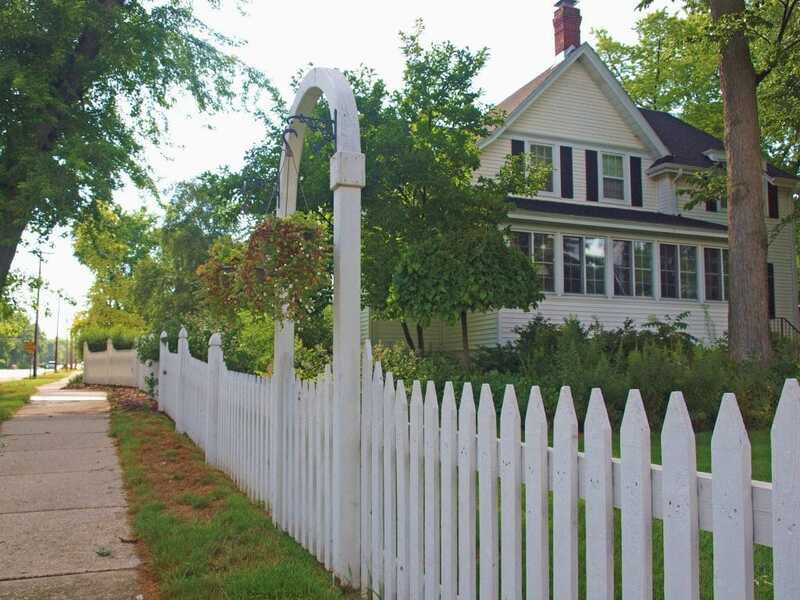 Picket fences (often called pallisade fences) are easily identifiable by their neat, evenly spaced vertical boards and are generally used as a decorative boundary – most commonly in front yards. They do not provide privacy but do mark out a boundary clearly and provide a nice aesthetic. They also provide a safe boundary for children and larger pets – although anything smaller than a dog is likely to disappear between the boards! Generally just under 1 metre in height and often painted white, picket fences are easy to install with posts. 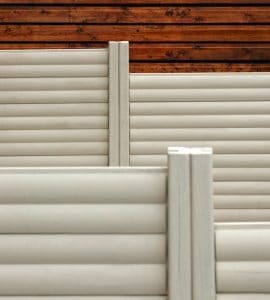 Picket fences are most commonly made from wood but can now be purchased in PVC for a low-maintenance finish. Picket fence panels are likely to set you back $50 upwards for a 4ft x 8ft panel. You can also get much smaller picket fence panels for use around borders and flower beds but we are concerned mostly with boundary fencing here. Picket fencing is commonly painted in an opaque white finish and we would recommend Owatrol’s Solid Color Stain as it’s easy to maintain and guaranteed not to peel or flake for 15 years! Privacy fences are excellent for providing privacy and are usually constructed with overlapping vertical feather edge boards. Each individual board is nailed to (usually 3) horizontal rails called arris rails and these in turn are supported by notched posts. If you are intending on erecting a privacy fence you need to know this from the outset as special notched posts must be purchased and set in further apart than for standard fence panels. These fences are strong and usually upwards of 6 feet tall (although you can make them smaller) meaning they are perfect for creating a secure and private boundary. They are most commonly used in rear yards, especially as many places have height restrictions placed on front aspect boundary fencing (you should check this out in your area before installing a new fence!). Closeboard fencing can be expensive – especially if you are having it installed by a professional – but kits can be purchased or you can buy ready-made panels for about $50 each (6ft long). You may also need to buy concrete or wooden gravel boards to put at the base of your fence . all in all this type of fence can become quite expensive but it creates a professional looking finish and as long as it is protected with a good quality wood protection it will last for years and years. This is the most common type of yard fencing and one of the easiest for the novice DIYer to install. Lap panel fences can be purchased in panels and attached to wooden fence panels using 2 or 3 U-shaped post clips per panel. If you have chosen concrete posts then lap panels can simple be slotted in – although if your posts are all up it is definitely a 2-man job to lift them up to the top to slot them in! Lap panel fences consist of a frame with horizontal overlapping boards slotted between. They have a more rustic look than a privacy fence. Lap panel fencing is perfect for providing privacy and a secure boundary, it’s also a cost effective option as each 6ft x 6ft panel will set you back little more than under $100. However, they are not as strong and durable as privacy fences. 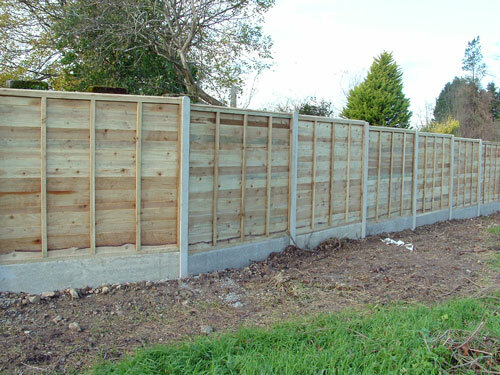 Lap panel fencing needs to be raised slightly from the ground or have concrete or treated wood gravel boards placed at the bottom to stop the panels from rotting. We would also strongly recommend treating it with a good quality wood protection coating – whether that be a matte opaque wood finish such as Solid Color Stain or a more natural look with something like Textrol saturating wood oil which penetrates the wood and protects it from within. If a lap panel fence is not protected from the elements in this way then it will quite become warped, split or even rotten as it is battered by rain and sun. There is a growing trend for composite wood fencing as it offers such a low maintenance approach to boundary fencing. These fences are more expensive but require little to no maintenance and are not subject to some of the problems associated with wooden fences. They will not split or splinter and often come with extremely long guarantees (sometimes up to 20 years). Composite fences are made from composite wood panels and are available in many different styles and sizes. It is likely to cost a fair bit more, perhaps than even privacy fencing but it depends on the look you are going for and the amount of maintenance you want to do. If you do go for a composite fence, do consider Owatrol’s winning pair of products designed specifically for composite wood. Compo Clean is a composite wood cleaner and de-greaser which will quickly and easily remove any built-up dirt and grease from all composite surfaces. Compo Care is a composite wood reviver designed specifically for protecting and reviving the color of composite wood surfaces. Trellis is an excellent way to create distinct spaces within your yard or to enclose particular areas. Whilst it’s open nature is not great for providing privacy you can train plants along it to give a more private feel. For example, a trellis panel can be great for hiding your wheelie bins or providing a wind screen for your barbecue – and it’s great for planting too. Trellis can be purchased in so many different sizes and styles that it’s difficult to give a price. As a rough idea, a fully structured fence panel in a trellis style could set you back about $45 per panel, whilst trellis to put along the top of another fence will be perhaps $30 per panel. Obviously you could pay more depending on the decorative nature of what you want. Generally though, it’s of more use within the garden rather than around it for keeping things in or out! These screens need to be secured to an existing fence or wall, or supported with posts or rails. They are quick to install and can provide instant privacy and protection from the wind. Do be careful though as they are not robust and can be easy damaged. If none of those took your fancy, there are an endless number of different types of decorative fence panels, from curvy tops to castle styles you’re bound to find something right for you – do be aware though that these can be costly! I like that you pointed out that trellis can deter thieves as they won’t hold the weight of a person and cause noise. I’ve always like iron trellises with the spikes on the top as well. I feel that they add a vintage feel to the home, keep away thieves, and look gorgeous in the sunlight.